And how she fixed the problem, according to the former presidential aide and famed reputation management guru herself. When the TV series Scandal first aired in 2012, crisis comms expert Judy Smith, accustomed to helping others get out of a pickle, found herself trying to control the narrative about her own image. Scandal protagonist Olivia Pope is partially based on Smith’s former career as a press aide to President George HW Bush. On the show, Pope is a former White House communications director who, after an affair with the president, resigns to start her own crisis-management firm, Pope & Associates. 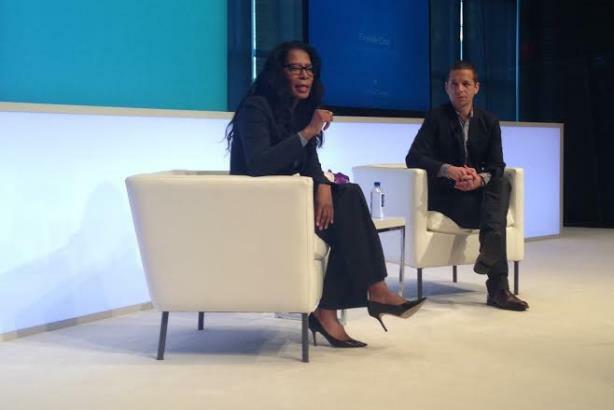 So the first time she was filled in on Scandal’s storyline, Smith immediately called Bush, she said Friday morning at LinkedIn’s CommsConnect NY summit. "I didn’t want [Bush] to hear about the show from anybody else," Smith recalled. However, she had to leave a message with his chief of staff. Bush and Smith played phone tag. But when the ex-president left her a voicemail, it was clear he was already in on the plot. "Love you. Want you. You left me. And by the way, this is the former leader of the free world. Call me," he jokingly stated. And when she finally got him on the phone, Smith helped Bush stay on message about the show and gave him talking points. "He was worried about people confirming an affair, and I told him, ‘But there was no affair,’" Smith recalled about their humorous conversation. "Then he was like, ‘This media stuff is moving so fast, I probably need to stay relevant.’ And I was like, ‘You are the former president, you are relevant.’"
Smith, who is co-executive producer and technical adviser for Scandal, said she sends notes for every episode and sometimes is on set. "I am focused on the things that need to be right," she said about her involvement with the show. Smith has served as founder and president of her own firm, Smith & Company, since 1996. In December, Sony Pictures Entertainment retained her as a crisis adviser to help with the company’s massive cyberattack. ABC renewed Scandal for another season this week. When emotion supersedes facts, a company cannot discount what people believe. The key to messaging in a situation like this is "meeting people where they are and taking them to where you need them to be," Smith said. "You are on a factual landscape and the audience you need to reach is on an emotional landscape, so you need to bridge that." Avoid retracting statements or actions, as credibility can be lost that way. Don’t tweet about something that is serious in nature. Really think about what vehicle you want to use to get a message out. When asked what Bill Cosby, who has been repeatedly accused of sexually assaulting women, should do to contend with his crisis, Smith dodged the question, prompting a few uncomfortable chuckles from the audience.